Cape Town - Some five days out from the New Year Test, prospects look very rosy that Jacques Kallis will be able to play a full all-rounder’s role for the Proteas in the first encounter with New Zealand at Newlands here. The 37-year-old batted in the nets at the ground on Friday afternoon as the national team began their preparation for the Test match, and a gratifying sight a bit later for all of those watching - except if they were Black Caps fans or spies, of course – was Kallis picking a new ball from the box and sending down a few deliveries off a shortened run-up. Kallis is the type of bowler who can hit the pitch hard and generate deceptive pace even after just ambling in, and that was the case as he appeared to get through the session satisfyingly unscathed. He has not bowled since inconveniently breaking down during the Australian first innings in the second Test at Adelaide last month - he had ripped out both Ed Cowan and Ricky Ponting in three and a half overs before experiencing a hamstring problem. 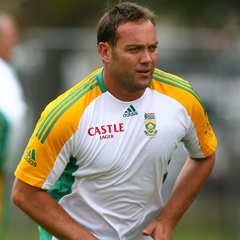 Kallis played the rest of that match as a batsman only and on the same basis in the decisive final Test at Perth, where South Africa won by 309 runs. But now he looks extremely likely to restore the desired balance to the Proteas side by being available as the fourth seamer at Newlands from next Wednesday, even if the ageing legend may only be expected to offer nine or 10 overs a day if required. It remains uncertain whether Vernon Philander, also wrestling hamstring issues, will be able to take his place. The bustling Cape Cobras phenomenon did not take part in the nets part of the training session, although he did some of the other drills ahead of it. Philander had broken down during a Sunfoil Series match for his franchise against the Titans at Newlands before Christmas, and Rory Kleinveldt will almost certainly deputise if the former fails to make the cut. At a short media briefing before the practice, coach Gary Kirsten said: “There is a concern there (over Philander) ... we are still hopeful he’ll play and he’s with us (in the lead-up).